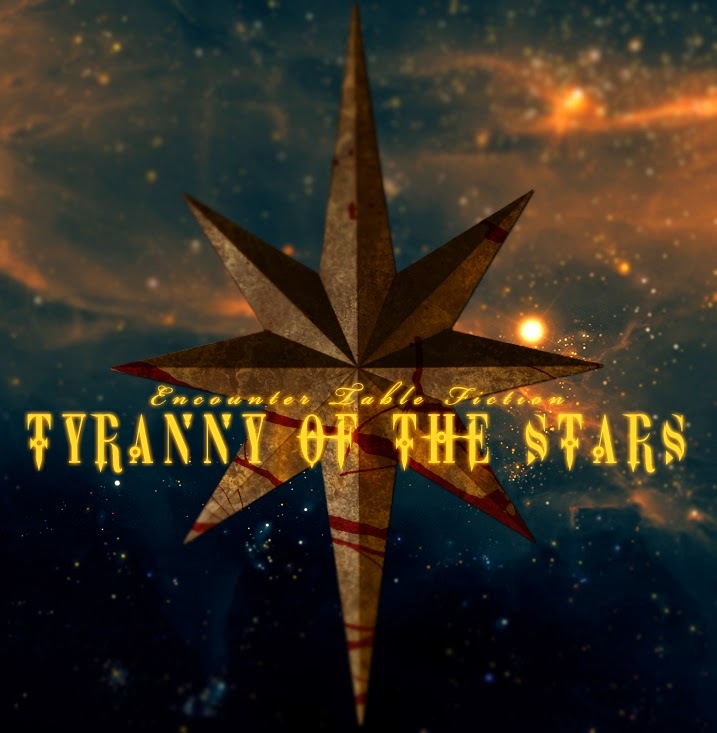 Tyranny of the Stars, by Robert Brookes. Paizocon 2014 is just a few weeks away and the Encounter Table will be there covering events and panels on our Facebook page. The Paizo website is accepting signups for Paizocon's lottery events until June 9th, so if you're going to Paizocon this year and would like to get in on some of the most exclusive gaming experiences the convention has to offer, check out their signup page. Make sure to like the Encounter Table on Facebook to get all of our updates from the floor of Paizocon in July. This week Encounter Table Fiction continues the adventure of Patris and Aribessa in the clockwork city of Alkenstar in the latest installment of Tyranny of the Stars. In the Between the Lines supplemental article, we discover the power of the lost Rogarvian bloodline of Brevoy. A rhythmic knocking rouses Patris from sleep, a persistent enough beat to have only two possible sources. "I'd best be under arrest," he mumbles to himself, crawling out of bed to cross his room with a staggering gait. Unlocking the door, he pulls it open only a crack, enough that he can see Aribessa's beaming expression staring at him through the gap. "Patris!" She exclaims, much to the frustration of the adjacent rooms. Patris can't quite brace the door quick enough, and Aribessa shoves her way in with the clomp of boots and a dusting of soot coming off of her clothes. "Where've you been? You said we were going to get something to eat last night, and you left me waiting here for hours." Patris pushes the door shut with a soft click. "I went up to your room and you weren't—"
"Sorry, I passed out," Aribessa's explanation is a hastily delivered one. More concerned with present matters, she clears Patris' backpack from a nearby table and lays her satchel down in its place. "I woke up early this morning and headed out to meet with an old work aquaintance from the Society." Beginning to ramble, Aribessa hefts a thick, leatherbound book out of her satchel and lays it out on the table beside it. Brows furrowing together, Patris slowly approaches, giving ample scrutiny to both Aribessa's actions and the book. A cursory glance down to his backpack—contents spilled out on the floor—comes a moment afterward. "This has what to do with waking me up before dawn?" A fat sack of coins comes out of the satchel next, set on the table with a jingle and a thud. Aribessa and Patris' eyes meet at that revelation, and his question is sufficiently answered. Of course, she has a more verbal answer to supplement. "Employment," she states cheerfully. "There's an expedition headed out into the wastes tomorrow and I got us in." "W-Wait—" Patris stammers. He has so many problems with that last sentence it's hard to pick just one to get clarification on. "You signed me up for some—you signed me up to go into the Mana Wastes without even asking me?" "I thought you might say no," Aribessa murmurs as she opens the book, flipping through old, dog-eared pages full of geometric shapes and text unfamiliar to Patris. "It's fifteen hundred gold up front," is all the interjection Patris needs to to hear to have the wind knocked out of his argumentative sails. "There's three hundred platinum coins in that bag, a fifty-fifty split for us at that rate. If the expedition is fruitful we'll be receiving a bonus on return." At a loss for words, Patris stares at the bag of coins. He searches for something—anything—to say in response that isn't a mouth full of half-finished words. "It's—it's casings," is the best he can muster. "Pardon?" Aribessa doesn't look up from her book as she asks that, two fingers tracing a line of text in search for a specific entry. "They—people here call a gold coin a 'casing.'" Partis feels obliged to explain. "It's fifteen hundred casings up frone, not—"
"This!" Aribessa taps a line of text with two fingers triumphantly, tugging out a chair from the table to sit in without so much as taking her eyes off of the book. Exasperatedly, Patris exhales a sigh and circles around to the other side of the table. Squinting at the book, he's unsure of what to make of it. "So, what's up with the book? Is this related to—"
"Magic," Aribessa clarifies, briefly looking up to Patris. "I'm trying to memorize a few incantations I'll need, I didn't have time earlier. So, if you don't mind..." she gives a shooing motion to Patris, in spite of it being his own room. For a moment he considers calling her out on that, but after a few moments realizes the value in picking his battles. On his way over to his bed, Patris half-heartedly notes, "Wake me when you're done." Or later, is an addendum left unsaid. Hours later isn't what Patris expected, but it winds up being the consolation prize Aribessa affords him. By the time he wakes again, the midday sun peeks through with murky quality between drawn blinds. The sound of Aribessa letting herself back into the room stirs Patris from his sleep, along with the jingle and clink of canvas bags heavy with recent purchases. "If you're dead I'm not paying to bury you," Aribessa teases as she closes the door with a bump of her hip, both arms otherwise occupied. "Or whatever it is they do here. Shoot you out of a cannon?" Stifling a laugh, Patris sits up in bed, blanket draped over his shoulders and hair a tousled mess. "I'm not sure that's a traditional Pharasmin burial rite," he quips, flashing the young woman a crooked smile. "Maybe if they handed over responsibility to the church of Brigh, but..." he loses interest in the joke, instead eyeing the bags Aribessa sets down on the floor with a raised brow. "I picked up some things. I didn't want to disturb you when I was done this morning, I— I felt bad for just rolling over you the way I did." The first bag is pulled open and a heavy cloth bundle is removed, set on the adjacent table and given a gentle pat. "This is for you," comes with a faint smile, regarding Patris from across the room. "Earplugs?" He asks with a wry smile, standing up from the bed with a slow groan, stretching as he does. Aribessa's look in return is briefly, and playfully, cross. "Armor." Pulling back some of the cloth, Aribessa reveals a few shining links of chainmail. "I pretty much press-ganged you into this, so..." It's the first genuinely thoughtful thing Aribessa has done since Patris had met her, and it takes a few moments during his slow approach to her for it to really sink in. He doesn't immediately know how to respond, and instead unwraps the burgundy linen cloak the armor is concealed by. The cloak itself earns silent inspection, with its burnished copper clasps and silk embroidery. It's draped over the back of one chair, allowing Patris to unfold the chainmail, revealing it to be a long shirt of fine silvery links with half sleeves and a steel gorget to protect the throat. "Elven steel," Aribessa says softly as she watches Patris examine the armor. "Mithril." Coming to stand beside him, Aribessa keeps her hands behind her back, concealing the last item she'd removed from the back. "I thought—"
Patris makes a croaking sound that's supposed to be words. He'd intended them to be words. Words are hard. Instead he just turns the armor around, held up by the shoulders, watching the way the muted light in the room glitters off of the chain links. "Hold your breath," Aribessa urges softly, before offering out what she'd kept behind her back. Patris' eyes divert down to a long black scabbard held fast in her gloved hands. The armor is laid down atop the cloak, and Patris reaches for the straight blade with an unsteady hand. He tests its weight, sheathed as it is, then slowly draws the sword out with the soft shearing sound of steel on oiled leather. The curved blade is three and a half feet long, tapered to a wedge at the tip and sharpened only on one end. A coiled dragon wraps around the cross-guard, wings forming a basket to guard the grip. Now he's speechless. For all that Patris can't form the proper words to show appreciation, Aribessa seems likewise devoid of her usual loquacious proclivities. Instead, she watches Patris' appreciative inspection of the fine blade and the way he deftly handles it with a practiced arm. This isn't just any sword. Patris knows this, and he surmises Aribessa must as well. "How did you know?" He finally manages to ask. "Your tattoo," Aribessa taps the same side of her neck that Patris' dragon tattoo is on. "I mean, you look Brevic. But the tattoo... 'with fire and blood'. House Rogarvia. That, the way you carry yourself... I'd guessed you were trained by the Aldori swordlords." Though Aribessa is smiling, it is a bittersweet one tempered by questions she is too polite to ask. Questions about how an Aldori swordlord of Rogarvia winds up a penniless deckhand. Sheathing the sword, Patris looks distraught. He sets it down on the table, looking at it with an unsteady stare, the way someone might regard a wild dog. Shaking his head, Patris steps away from the table and starts to head for the door, but his barefooted stride is reminder enough that he's not yet fit to go outside. "It's fine," Patris lies. "Could you..." he runs a hand through his hair, exhaling a steady sigh. "Just—give me some space. I need—I should go bathe." Taking the hint, Aribessa smiles awkwardly and dips her head down into a slow, steady nod and shuffles towards the door. She says nothing when Patris opens it for her, likewise when she steps into the hall and he shuts it behind her. Aribessa is sure he'll come around. She's counting on it. The blood of Choral the Conqueror flows pure through your veins. Benefit: You gain fire resistance 5 and a +5 bonus on Diplomacy and Intimidate checks against red dragons. For the purposes of effects targeting creatures by type (such as a ranger's favored enemy and bane weapons), you count as both humanoid and dragon. Special: This feat must be taken at 1st level.